Easily Shorten Your Long URLs and make them catchy with your own keywords in it. This URL Shortener can create over 1000 new links within a couple of minutes that will automatically redirect to your site. There are many different link types that the our software can create. The so called 301 redirect type is the one everyone is interested in. It will carry over the PR from the domain to your site which makes this tool so powerful. Just blast your new Short-URLs with your favourite SEO tool such as GSA Search Engine Ranker. Use the power of GSA URL Redirect PRO and stop fearing another google update. Stop wasting money buying strong domains to use your own 301 redirects for your SEO. 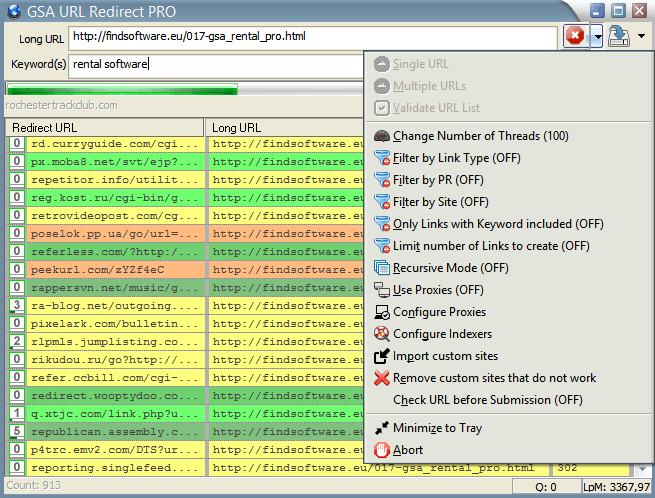 Just GSA URL Redirect PRO for your needs.